Before it became "JUTE MAT"
It is rarely find the information of Jute mat in Thailand since the planting area is quite limited in certain area. Jute is used as a structure(warp) of reed/sedge mat, however, it is more common to use nylon as a warp due to cost control, complexity of production process, and limited material in some area. Do you know that we always confuse between Kenaf and jute which they are totally different? This category is widely made paper, robe, rice sack. This is the raw material we make placemats and mat in Chantaburi. It is not being known that Chantaburi's artisans weave this jute mat since the stiffness of the yarn tend to make more troublesome then sedge. In the historical research of reed mat in the attached references, it shows that Her Majesty the Queen of King Prajadhipok has studied the process of reed mat when she lived in Chantaburi. Reed mat is believed that it belongs to Vietnamese. She tried to experiment by developing the mat to other uses because mat making is diminish from the community since Vietnamese have turned to jewellers. She is a leader who try to sustain this craft technique and promoted to all villagers, and that is the beginning of mat industry in Chantaburi. In that old days, nobody knows about nylon as an alternative material of jute. Jute is a natural material that is generally found in Chataburi and other places in Thailand. Mat makers has been taught to use jute as a warp for mat making. Why do we use jute rather than kenaf or Nylon? 1. Kenaf has not been planted in Chantaburi. It is common to the north east to plant kenaf for rice sack industry. 2. The flexibility of kenaf is less flexible than jute which means jute is much stronger material. 3. Nylon does not last to compare with natural material as jute. Moreover, it hardly shapes into flat piece after bending. It is used to form small products such as bag, purse. Why do we pay more for jute mat? 1. It rarely found jute plantation in Thailand. We mostly find Kenaf rather than jute as it is in a large industry of making robe and sack which they has been made by machine. 2. Since the complexity of making one spindle of jute yarn takes time. Jute does not come as a yarn after harvesting. Its process is similar to cotton. - The maker will leave jute under sunlight for a week. - When it is totally dry, they will bring into grinding process. - Next is the spinning process to make a loom of jute yarn. - Lastly, they will stretch jute as a warp of handloom to start mat weaving by inserting weft into the loom. - Pattern is created through colour changing, mixing material between warp and weft or weaving techniques. 3. The villagers are influenced by market demand when the price of reed/sedge mat as equal as jute mat. 4. Jute is used as warp in reed mat making in other villages. Chantaburi can customise jute mat that is made of 100% jute (warp and weft) without substituting with nylon or reed. That is why we try to support this villagers to produce jute mat before these technique has deminished from our country. This is our first time joining International Innovative Craft Fair, IICF. It is the art and craft fair and exhibition that has been held for five years. This year, they focus on the theme of "The New Traditional". They aim to promote art and craft from Asia to the buyers, traders, importers, and exporters nationally and internationally. This is our great opportunity that has been selected and supported by the SUPPORT Arts and Crafts International Center of Thailand, SACICT. We have learnt how to approach European buyers, how to develop our products to the needs of consumers. Thank you XCON, the organiser who operates this fair smoothly. Thank you all the vendors who are being a part of this successful fair. Thank you for friendship that we believe we cannot acquire from other trade fair. Most of all, we would like to thank you SACICT that believe in Maison Craft. Please enjoy and save the date for the next craft fair! The perfection of the imperfection of craft is known in Japan as Wabi-sabi. The beauty of hand craft has shown through its texture. The unrefined colour that is only created by natural material. Craft reflects the hardship of the craftsmen who produce it. There is no other technology and machine can replicate this imperfection of craft. I personally admire these master craftsmen who help teaching their valuable technique to the others. I also appreciate the effort of the makers who keep learning and help sustaining these crafts to the next generation. Few hundred century ago, the textile from China has widespread to many countries from Far East to Roman Empire. The Roman Emperor has strongly admired the beauty of fabric since silk fabric are exported worldwide. The Roman try to source the material to make this fabric for several years. Consequently, they discovered that it is made from moth cocoon. However, Roman Empire has different resources to produce silk fabric. It has been studied for years what type of natural material can produce this delicate silk. Finally, they learn how to utilise the spider web that are very elastic and strong to compare with silk moth. It is an incredible source that create this charming golden silk fabric. It is a wisdom of Roman craft that try to source their own material. It is a natural gold colour from spider silk. This material is very unique because it can not be mass produced. Even though a large number of scientists have researched the new technology to replicate this material, there is little know-how to produce the similarity of spider silk. Who knows the spider web that we normally see it as a waste can create such a unique craft. 1. Shower bowl: in the last time when we need to collect the rain to shower from an earthen jar. 2. Rice bowl: It serve its temperature of what it contains efficiently. Thai people use to drink water from silver bowl and even rice bowl for family. 3. Water festival equipment: It is our culture to pay respect to the elderly of Thai family in every year. Thai people will use silver bowl that contains of jasmine and Thai perfume. The young pour scented water over their elder’s hands, they in return, wish them good health, happiness and prosperity. This tradition of paying respect, is called “Rod Nam Dam Hua”. It is being replaced by plastic ware and machine made silver bowl which is cheaper and easy to find in the supermarket. And here is the end of Thai silverware. The place that used to called a village of handmade silverware is left only its legend. As I have been working in design industry for many years. 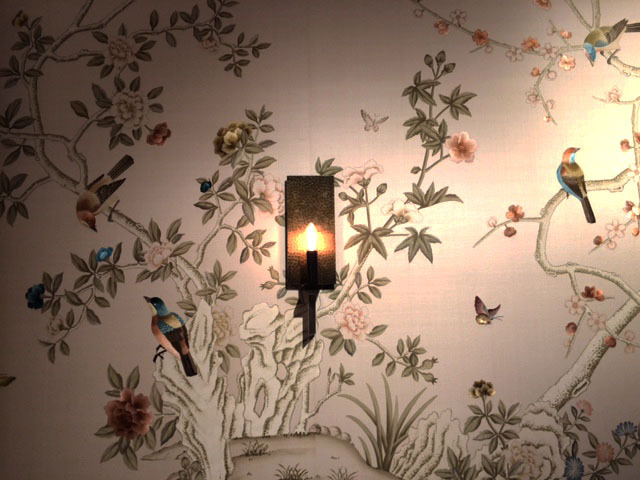 I remember the name of Fromental, the luxury brand that is known for its hand painted and embroidery wallpaper. They are British company which mainly produces high class wallpaper for hotels and exclusive residents. After I visit their showroom during London Design Week, I come back to do more research on it. This wallpaper is created by Suzhou artisans. 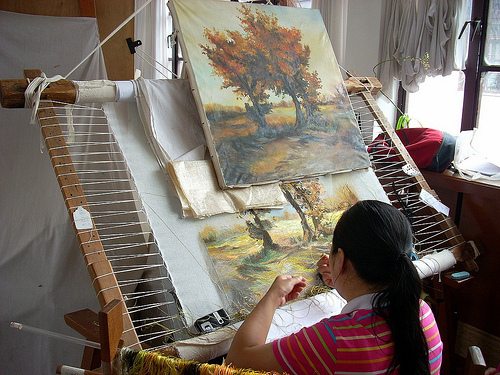 Originally, Suzhou women normally use fine silk that mainly produces in Suzhou, a homeland of silk farm. They are one of the most finest technique in the world since it is discovered that this Suzhou artisans used to make a map in the second AD. Later, they become one of Chinese emporor's valuable presents that is given in ceremony occasion. To create artistic wallpaper, it requires needle, silk thread, and the skilful technique. The different of machine and Suzhou embroidery is its thickness of thread, the uneven of stitching line, and shading colour. The masterpiece uses random thickness of silk to create the liveliness of picture. The colour has to match and make a perfect gradient of shade and shadow with uneven stitching to bring the nature back to live. Most of Suzhou embroideries represent the abandon of nature and animal in China. Nowadays, it rarely finds the delicate and complex embroidery in the world. This is the sample piece that I took them from Fromental Showroom. British designer has minimised the complexity of embroidery part and kept the outline of hand-painting. They intend to emphasise the 3 dimensional effect of Suzhou embroidery. To craft this wall-covering, they need approximately at least 3 months to draft, paint and stitch. Sometimes the beauty of object does not express by itself. "In the rhythm of the needle, there is music for the soul." Bangkok, the capital city of Thailand which is the central business of the country. It is full of skyscrapers supporting business, residential, tourism industries. It gradually expands and develops that affect urban lifestyle. People seem to be rushing to follow this economical cycle. However, when we have a chance to visit to our hometown in the southern of Thailand. Truthfully, We have never been proud of being outreach. The small city that brought us up for 20 years has evoked us this time. What we used to experience, we still can find it in the same place. Housing, people, nature, and culture has never changed from our old days. They live without the skyscraper, high speed car, or even sky train. The local try to preserve what they have which sooner become a heritage for new generation. The missing value of the big city, yet it can be found from this small town, Songkhla. It is a charming beauty of Thailand that we have long history that is still preserved all over the country. Even though we are a small venture, we feel right to sustain what we are proud of. What we think that nobody has admired in this 21 century. We would like to show everyone the distinctive Thai in the way of Maison Craft. We value the art and craft which represents Thai expression in their own way. From the past London Design Week, not only the showcase of British design that has been exhibited in this festival, there are numerous art from all over the world. One of the most interesting designs is the integration of craft and everyday product. It is a creative idea of Japanese designer who transforms traditional lacquer ware to a stylish collection. A glass of water that we normally use, has been decorated with the colour of lacquer. It creates a stylish appearance from traditional technique which applies on different material. The artisan has to apply several layers, base coating, paper, gold leaf, and finish with glossy lacquer. They change the perception of ordinary glass with its design. The simple design that speaks gently to us. It creates uniqueness to its product. It increases the value to object. It is an intelligent and humbleness of craft. Porto Romana is a well known brand in the luxury handmade lighting and home accessories. They are one of English company that remain their production in the United Kingdom since it has started in 1988. The founder, Andrew and Sarah Hills have inspired from the historical Italian glassmaking and metalworking. 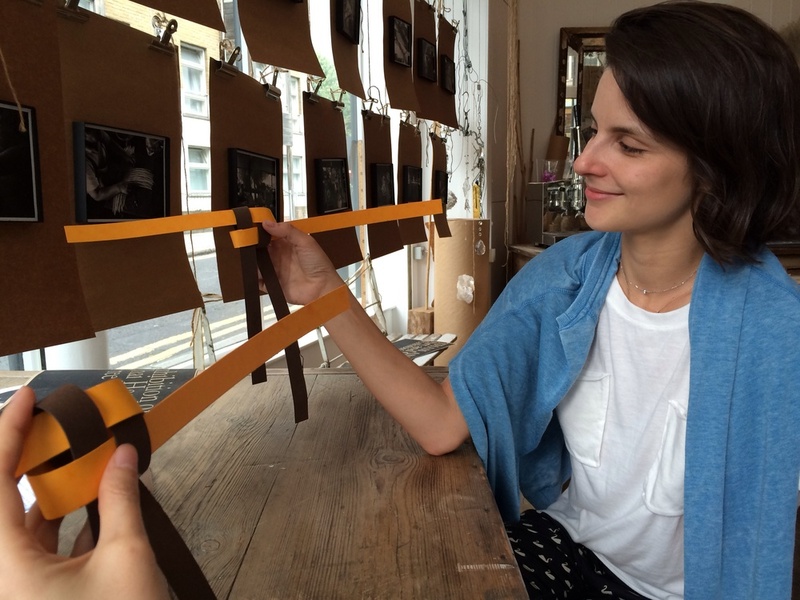 After they came back from Italy, they started their own craft studio in Surrey. They embrace numerous English artisans in London and countryside to collaborate and create a plenty of timeless collections. Today, it rarely sources a local business which continually supports English craftsmen. It is luckily that English craft is gradually protected and strongly support in their country. However, there are only few number of Thai crafts are perfectly sustained. It evokes us at the beginning of 2013 to create the idea that sustains our traditional wisdom. We name it as Maison Craft, home of stylish Asian crafts which intends to be one of the medium prolonging the craft to a new generation. I have never known a patient of a person who carves this spoon. Before it became a piece of wooden spoon for us to be used. Can you imagine how long it takes? At the first glance, it may looks as a simple ordinary spoon. If you may carefully look closer, you will notice the grain structure and its growth ring. See how attractive these pattern show what it is called the figure. This reflects the intention of a man who thoughtfully cut and process this piece of wood. Most importantly, it is a golden teak from a reforestation without planting programme by the majesty the king of Thailand. This mean the tree has not been cut, yet it wait till the time it falls apart. Tree trunk is sold to the furniture factory. The small pieces are normally left over and thrown as trash. Fortunately, uncle Sagha notices it and transforms them into kitchenwares. There are various amazing stories of craft product that I have just realised. This is one of wood making stories in northern Thailand which presents the effort and patient of a person who makes amazing wooden spoons. The growth ring of this piece shows a part of its 45 years long in the forest. In comparison, if it is a human, he or she is already grown up as an adult whereas this teak has just begun distributing its useful function and its beautiful figure to this world. Dedicate to a man who crafts the palm leave. Every time I walk pass Phayathai Road in the city of Bangkok, I always see an uncle who makes bunches of artificial flower from dry palm leaf. He will sit on a pavement concentrating to craft a new piece of craft. I recognised that he skilfully creates many forms of flower and animal at a time. It is surprising that a simple dry palm leaf from my aspect is just a leaf, yet this man has turned his imagination into animals. The more I am looking at his craft, the more I feel the genuine beauty of Thai craft. The products he made has reflected his intention on making. Every piece is distinctive since it is handcrafted. However, it shows an effort, meticulousness, and happiness of the maker. Today, I have realised one thing from him. The beauty of product may not just be revealed through its appearance. The intention and passion of the maker are the most valuable thing in handicrafts. One may appreciate the artefacts from its appearance but the value of it has yet to be told. Producing the crafts, not only do skill and experience are needed, but also proper tools substantially create a masterpiece. Next workshop is coming soon. Sign up with us for the update news and information! Time flies....it s the end of the exhibition. Maison Craft founder would like to thank you everyone who came for a visit, joined the workshop, and supported our venture. Even though we only had our launch exhibition in London for 7 days, we realise that there are lots of people who have the same attitude and appreciation, seeing our product as a piece of art. From all your feedbacks, we will develop the ideas for our next exhibition. We definitely have a session of handicraft workshop for our fans. Join us our mailing list. We will keep you post all the update news. See you soon! Maison Craft always seeks for a place of the best craft in every part of the world. Our mission is to convey a story beyond the experience from the adventurous journey, sourcing for the craft makers and exploring the craft products throughout Thailand. Come and appreciate all the stories together! Get crafty! Want to learn how to make simple Thai handicrafts this weekend. It lasts only 15 minutes and you can enjoy experiencing the original technique of traditional Thai craft. This FREE WORKSHOP is available in London until tomorrow. Visit us at 123 Bethnal Green from 12pm-6pm. You also can find us at Londonist recommended things to do in London.